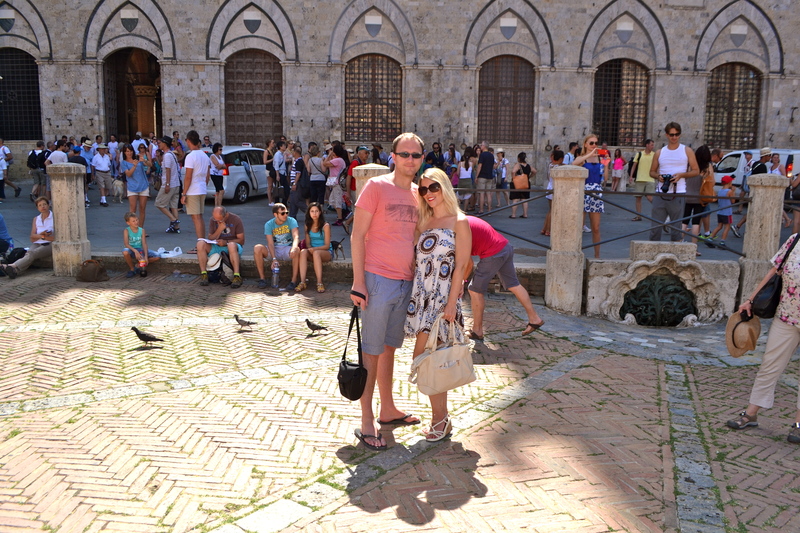 Tuscany is one of the few places in Europe I could keep coming back to. 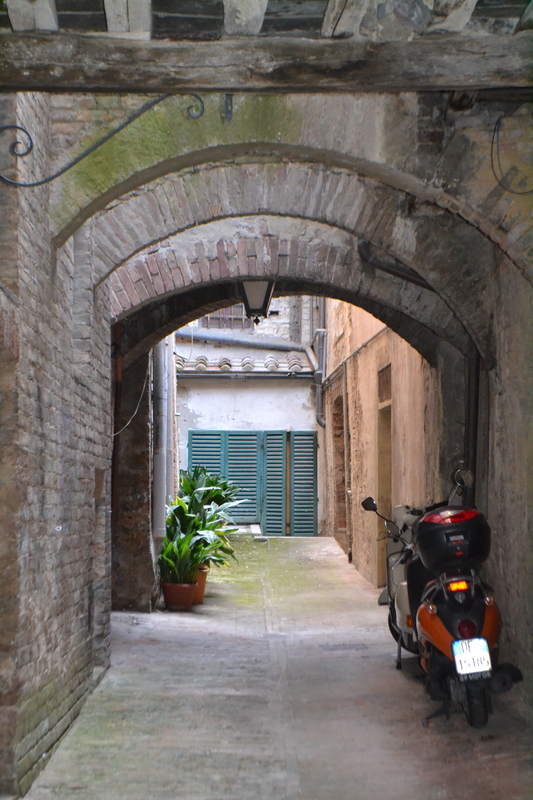 I could easily spend endless days in the garden of a Tuscan farmhouse sipping wine, eating figs and reading books. 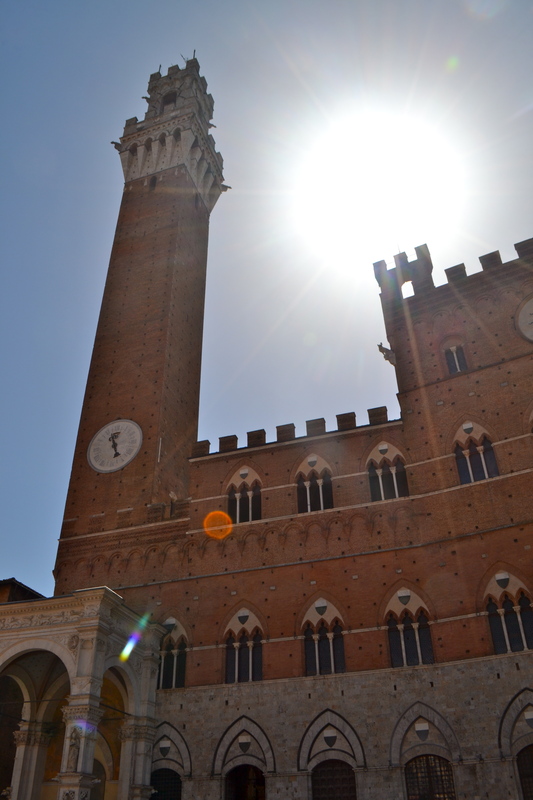 On my most recent visit to Tuscany, we decided to take a day trip down south to explore the delights of Siena. 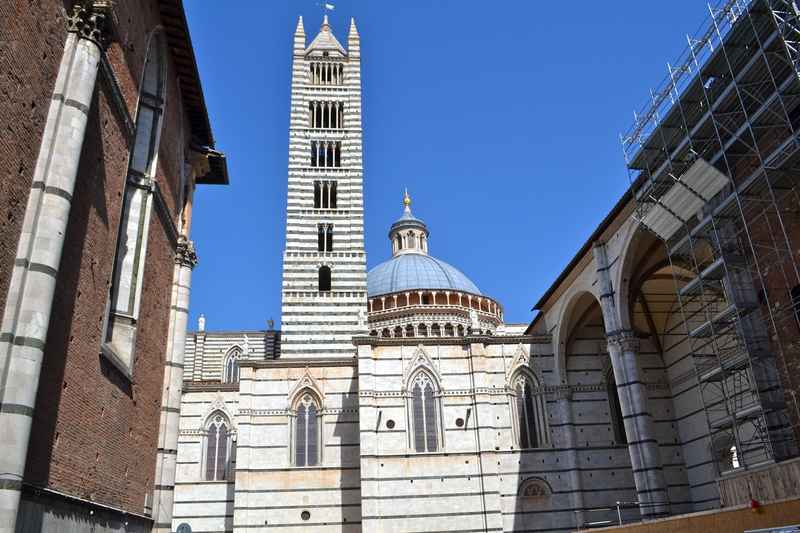 Siena has an irresistible charm with its winding streets, amazing food and somewhat mind-boggling ancient gothic architecture. 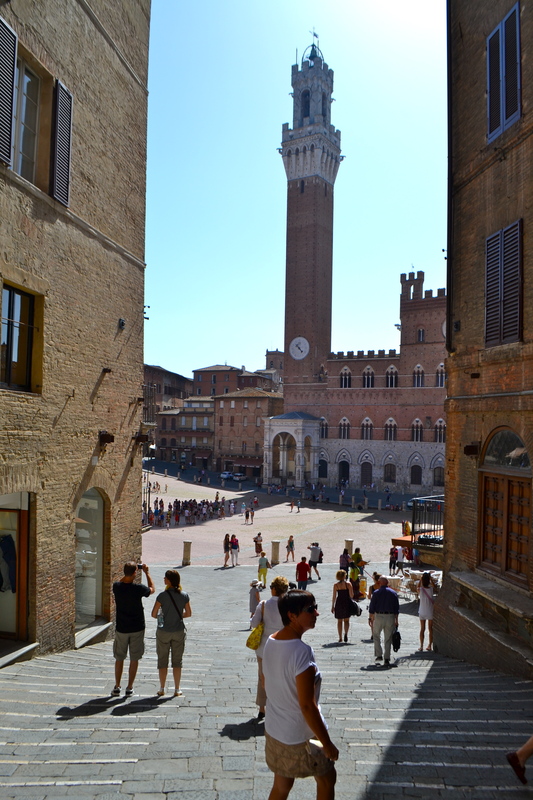 The historic centre of Siena is listed on the UNESCO World Heritage list and often referred to as a living embodiment of a medieval city and I could quickly see why. 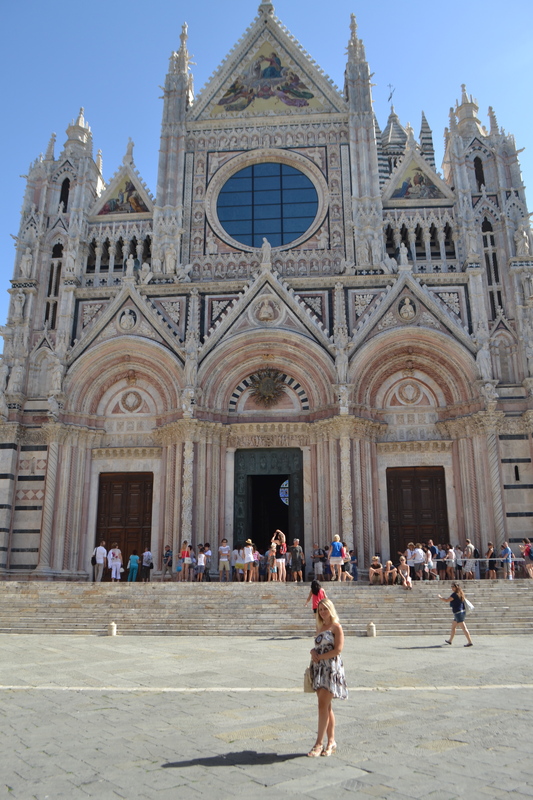 My tour of Siena started at the Duomo. 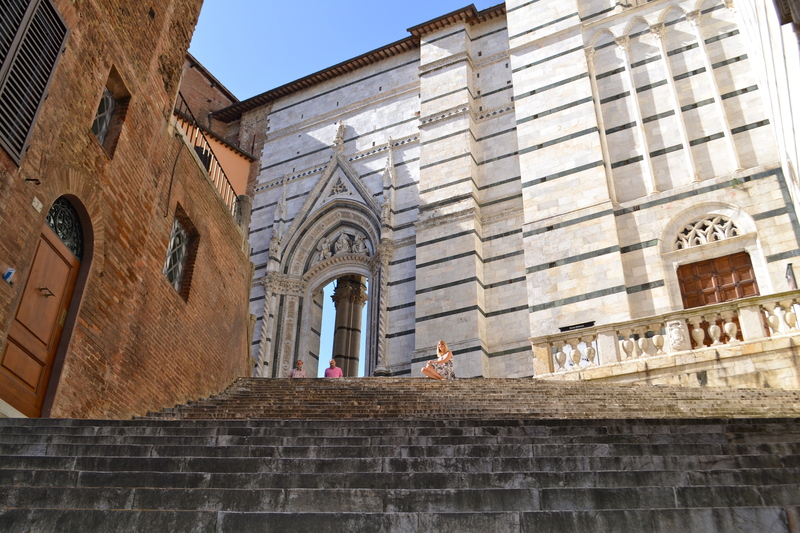 As I climbed the stairs towards the Duomo, I was instantly struck by its striking facade of white, green and red marble. It is hard to believe that construction commenced in 1215, much before building technology has become so advanced. 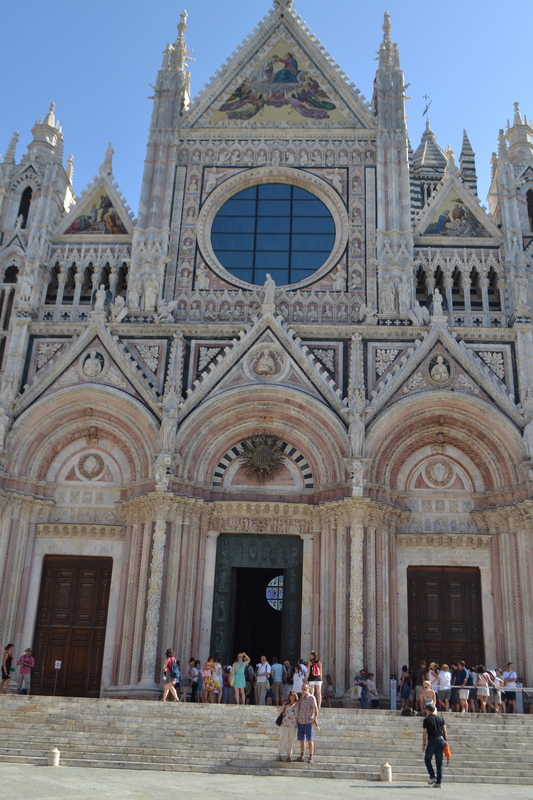 Try to get a sneak peek inside to view the amazing architecture. The use of black and white marbled pillars to match the exterior is simply stunning. 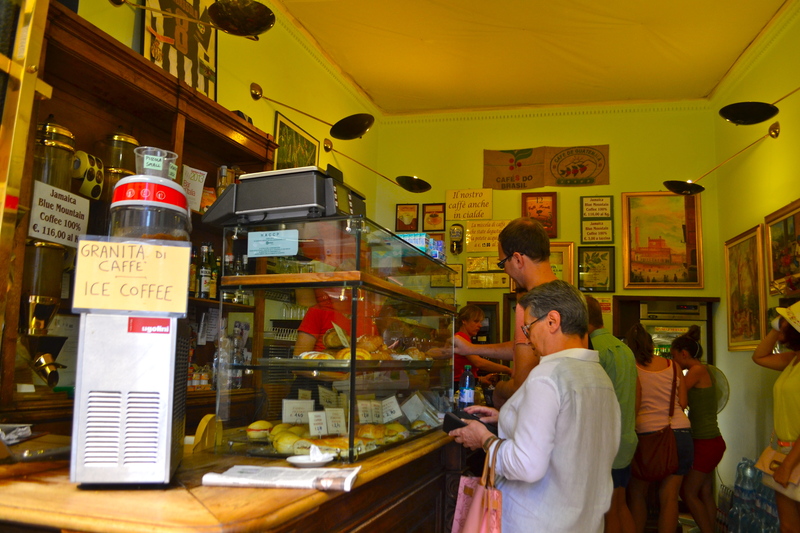 The first foodie pit stop of the day was the infamous Pasticceria Nannini, the home to some of Siena’s best coffees and pastries. 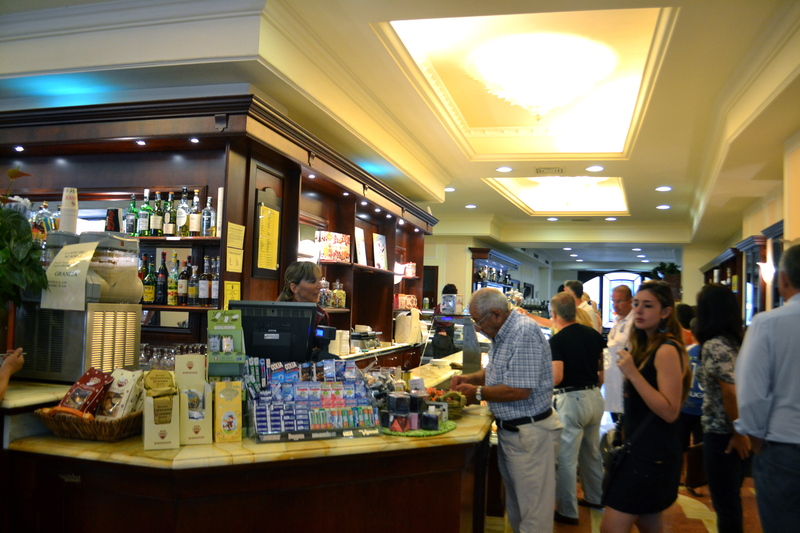 If you’re not lucky enough to find a table, there is plenty of bar space to perch by while you enjoy a pastry and an espresso. 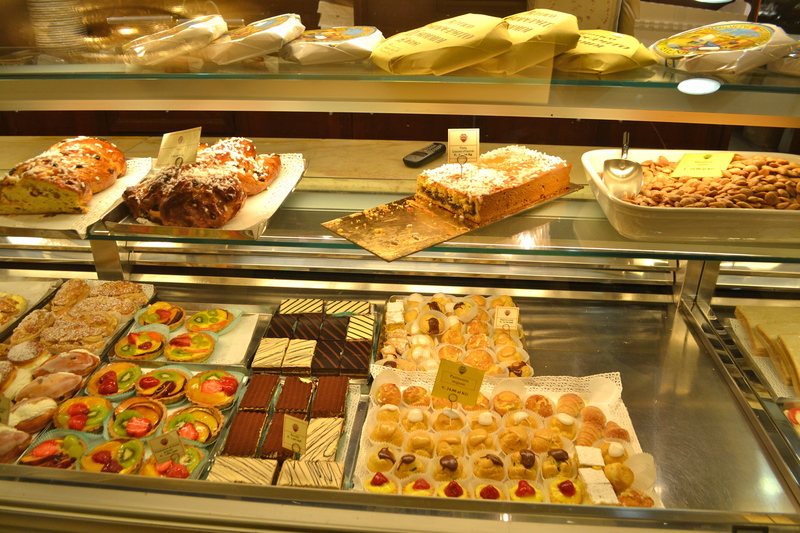 The panforte, panpepato and ricciarello come highly recommended. 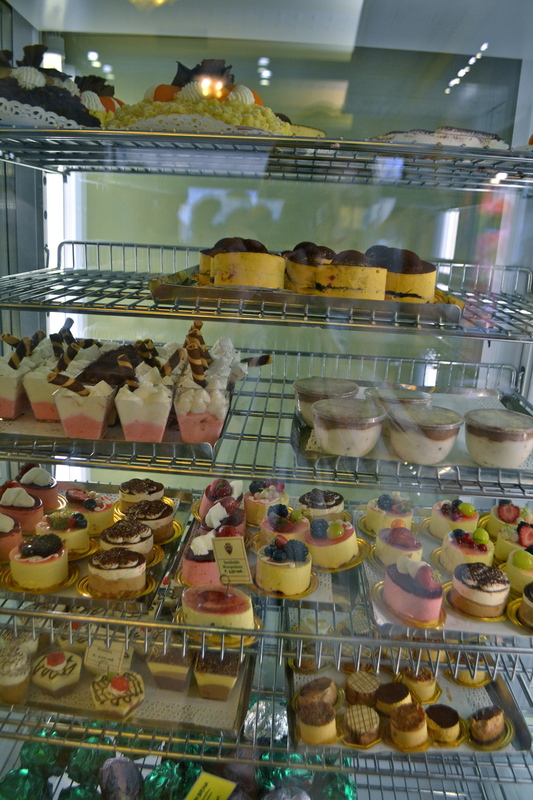 With such a mouth-watering selection of Pantone, crostini and Italian cakes it was a tough decision to decide on one (or two)!.. 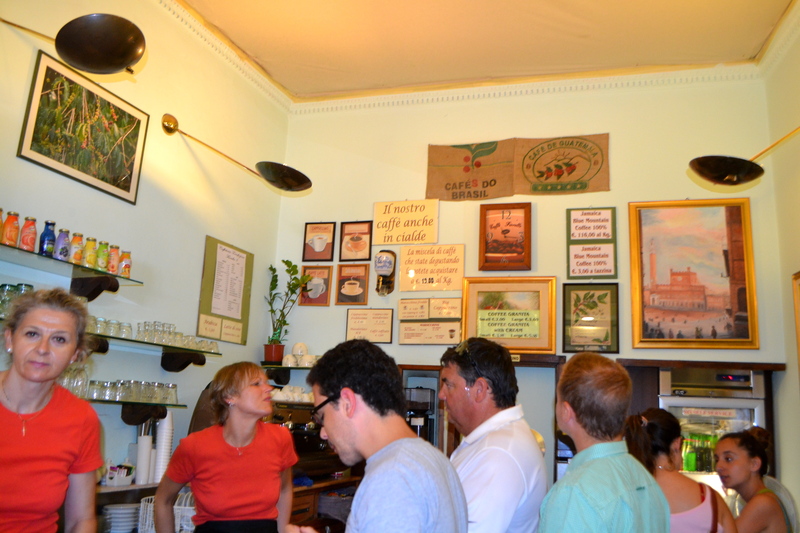 For the best coffee in town, you can’t go past Cafe Fiorella. 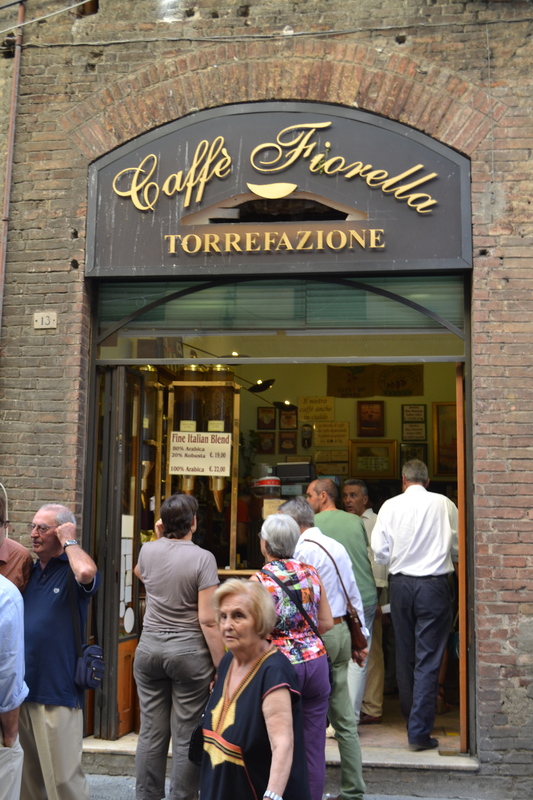 Step inside this tiny cafe (if you can squeeze in) and you will be greeted with the delicious aroma of their fine Italian blend. 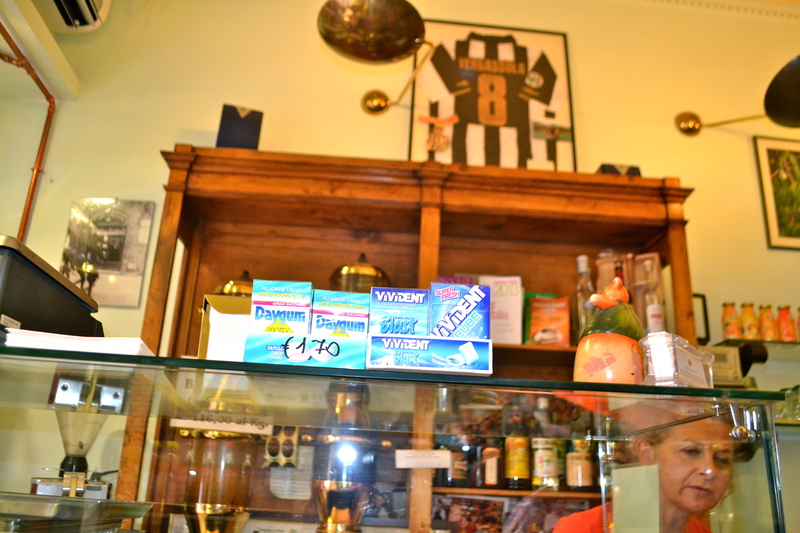 This cute cafe oozes with character with its football paraphernalia and has an understated authentic feel. With the temperate gauge soaring up to 40 degrees, it was a little too hot for an espresso so I settled on their Granita Di Caffe which was the cafe’s take on an ice coffee using their fine italian beans and a dollop of cream. It didn’t disappoint. 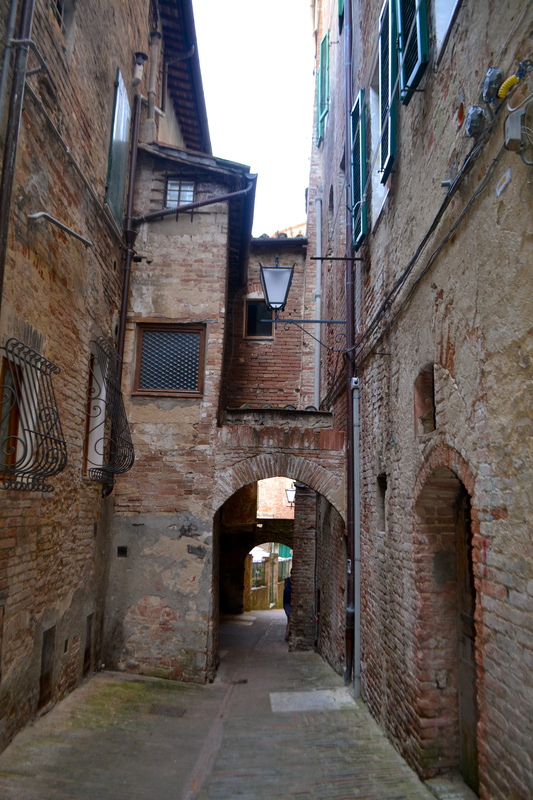 After getting hydrated and caffeinated we ventured down to explore Piazzo del Campo, the social heart of Siena. 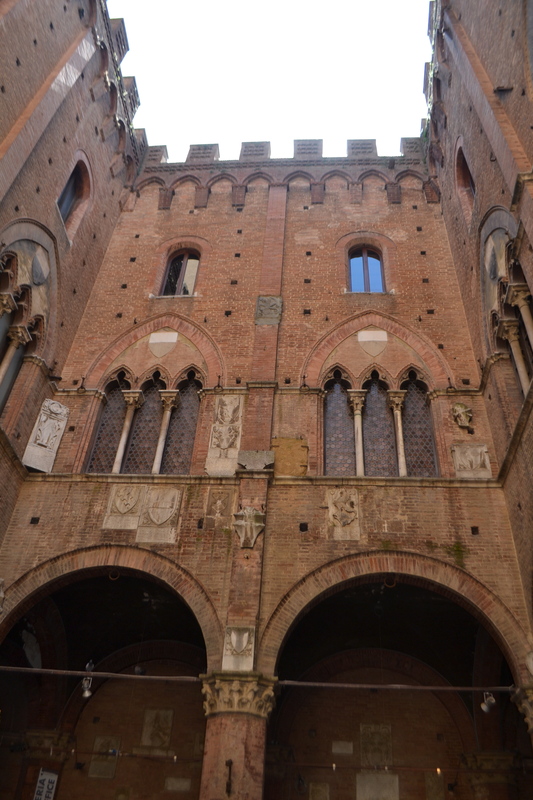 It’s centrepiece is the magnificent Gothic Building ‘Palazzo (town hall) which now houses the Museo Civico. 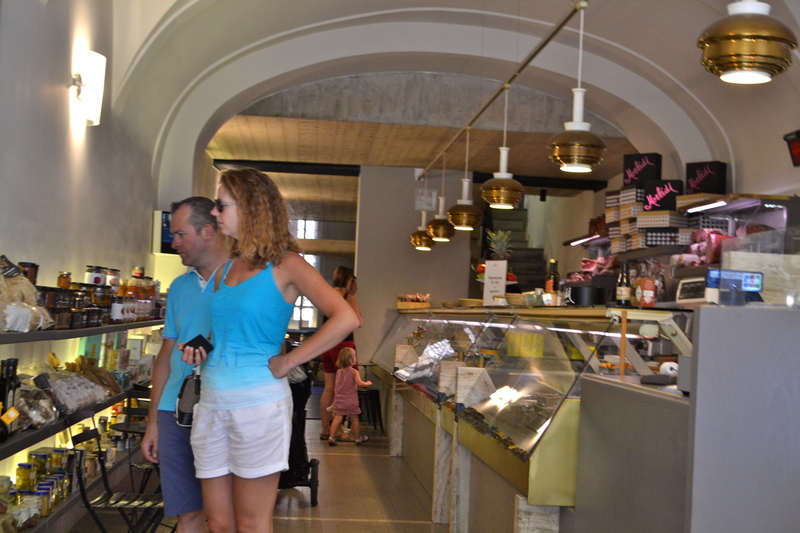 The area has a great atmosphere with locals and tourists alike sitting on the pavement drinking coffee, wine or just sun baking. 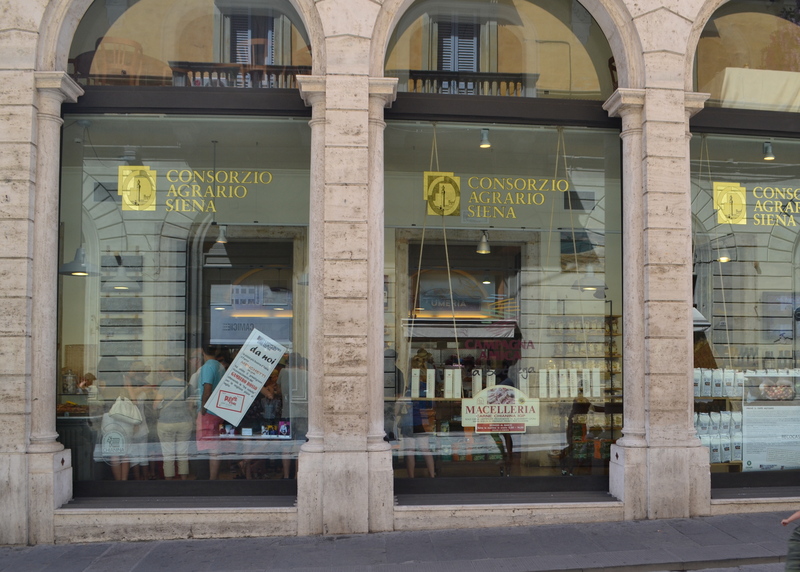 Although it’s a great spot to people watch, try to stay clear of the overpriced tourist traps which circle the Piazza and venture off the beaten track a little. 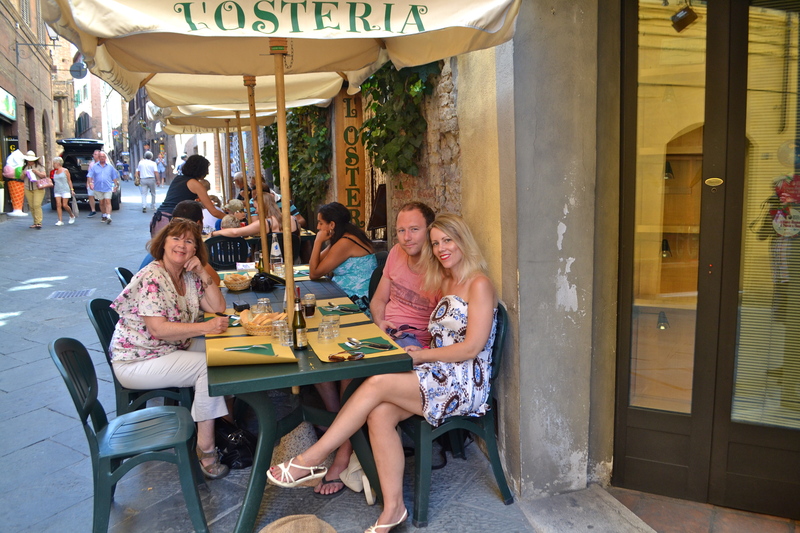 My very helpful Italian Twitter friend, Roberto (Holy Foccacia) recommended a lovely lunch spot in the centre of Siena called L’Osteria. 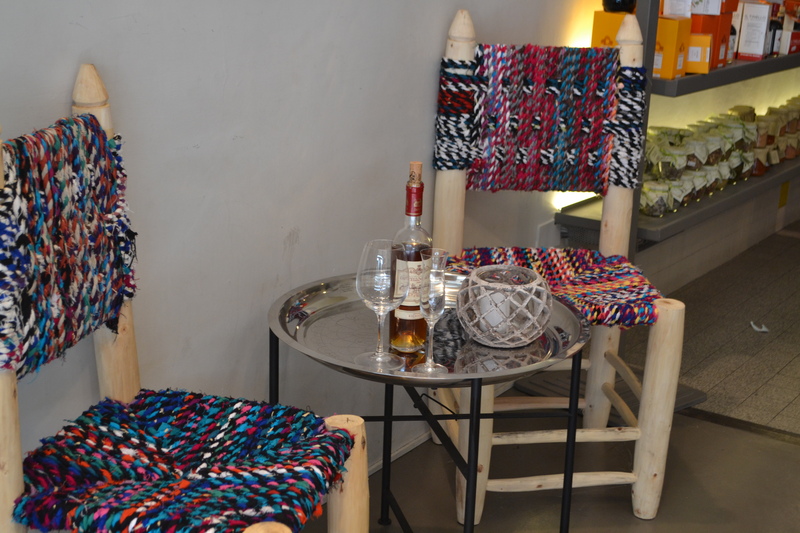 The restaurant had an authentic rustic feel and offered a great range of local delicacies at very reasonable prices. 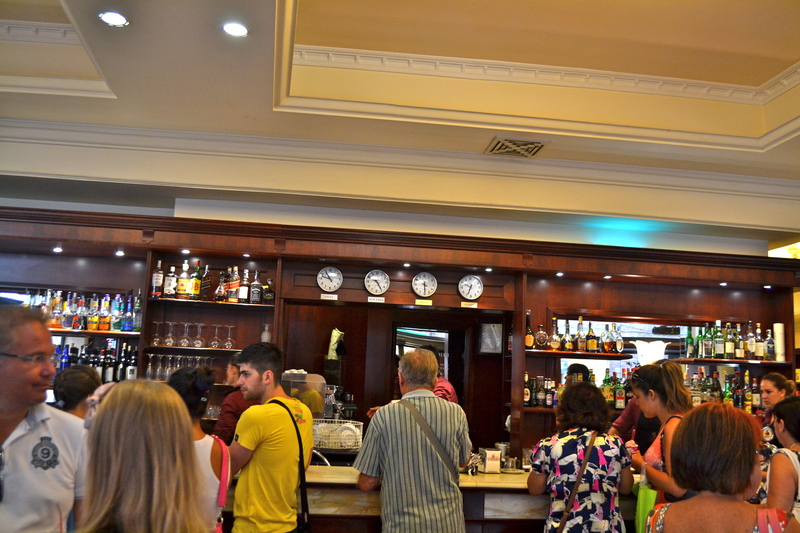 Over 50% of the diners were locals which was definitely a good sign. 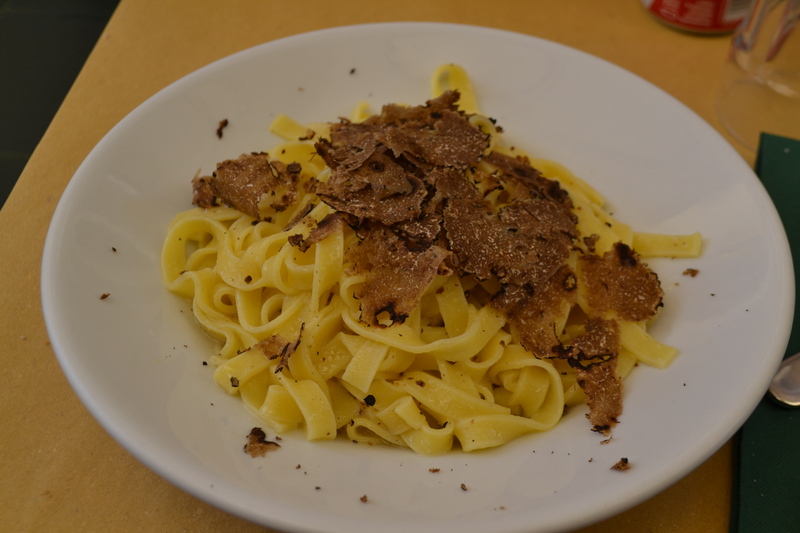 The truffle pasta was simply delicious. 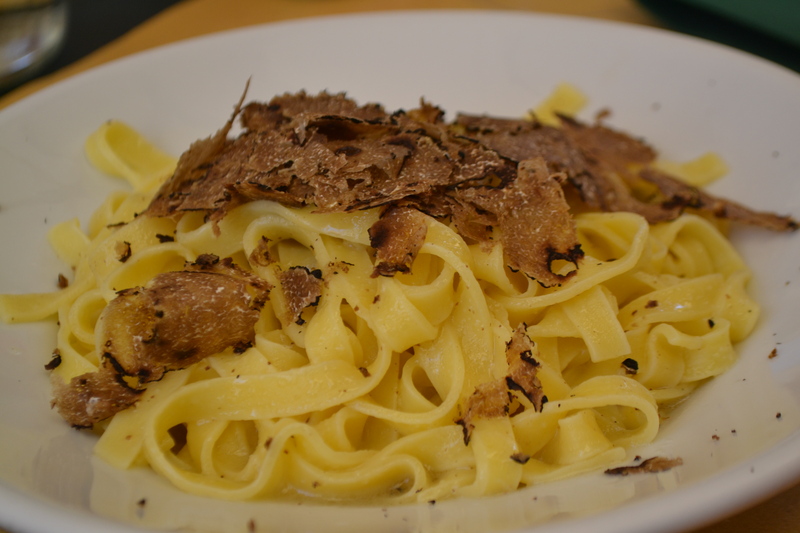 The velvety ribbons on pappardelle were cooked al dente and topped with a generous amount of locally sourced truffle. As was the pappardelle with mushrooms. 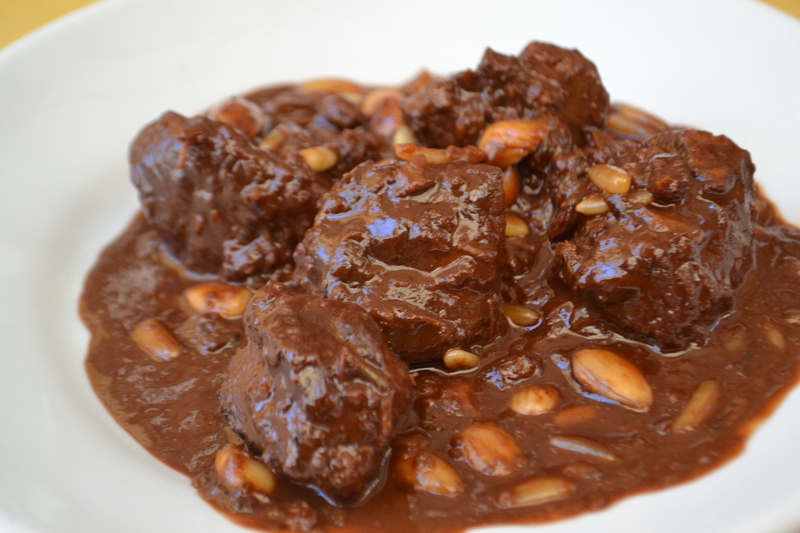 I couldn’t resist trying the local Tuscan speciality – wild boar slow cooked with chocolate, vinegar, pine nuts (pinols) raisins and almonds. If you are grimacing at the look of it – I did too. Turd on a plate definitely comes to mind. I found the textures and the flavours of the dish way too rich especially for a hot summer’s day. It needed something like bread, rice or pasta to break up the overpowering flavours a little. 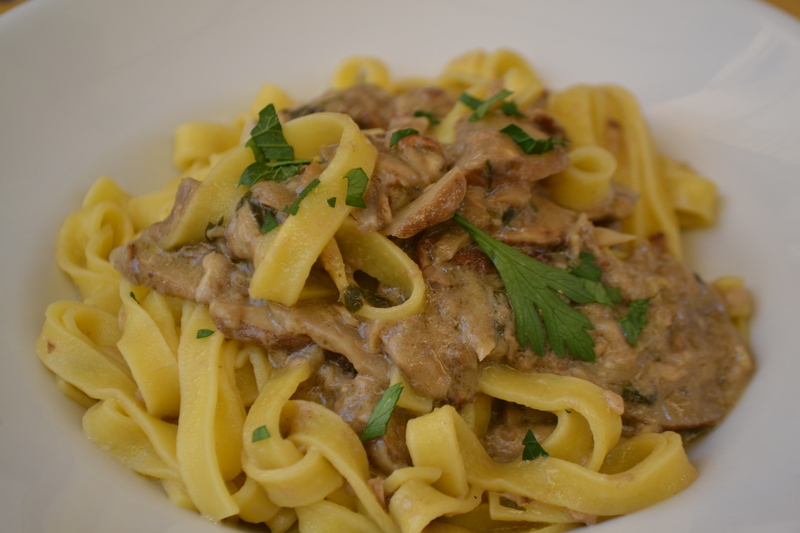 I think next time, I will try wild boar sauce sparingly on top of a big bowl of pasta. The flavours were good but too much of it just spoils it. 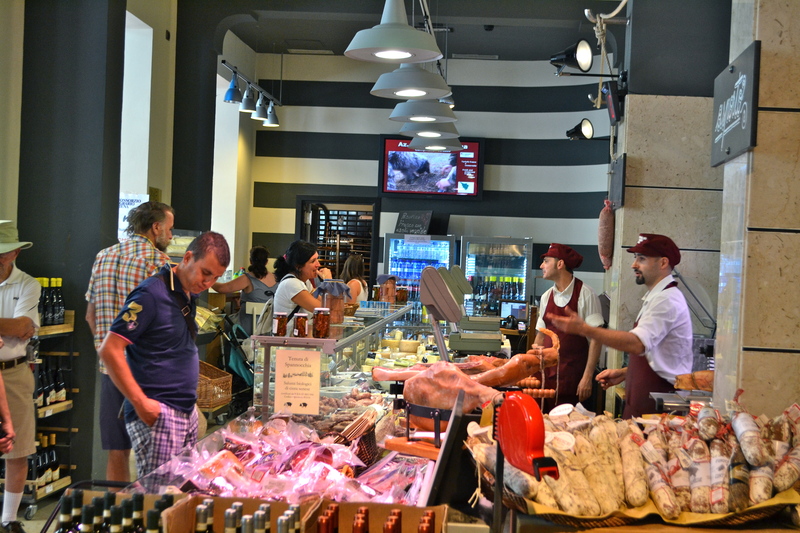 If you are on a budget, there are plenty of places to take away some top quality Tuscan produce and pack a summer picnic. 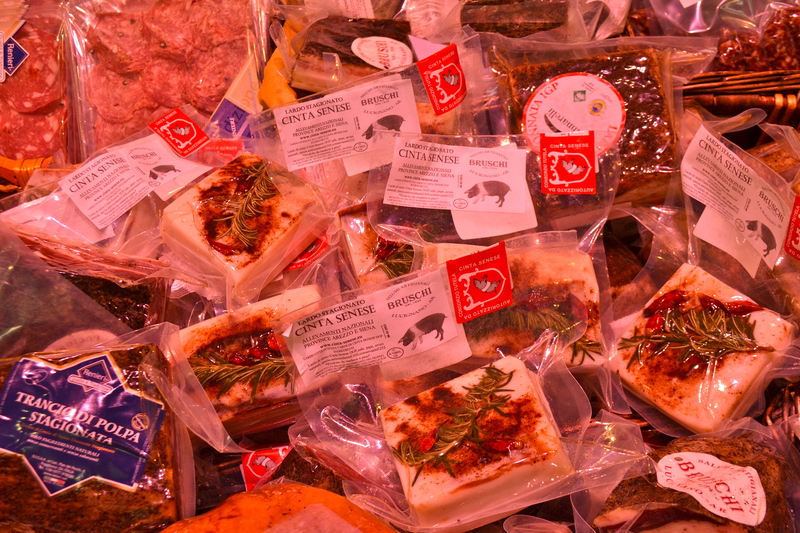 Gastronomes will be in heaven at Consorzio Agrario Di Siena, a local farmers co-op established in 1901.The produce here isn’t cheap but you can rest assured you are not being ripped off – it is also a popular spot for the locals. 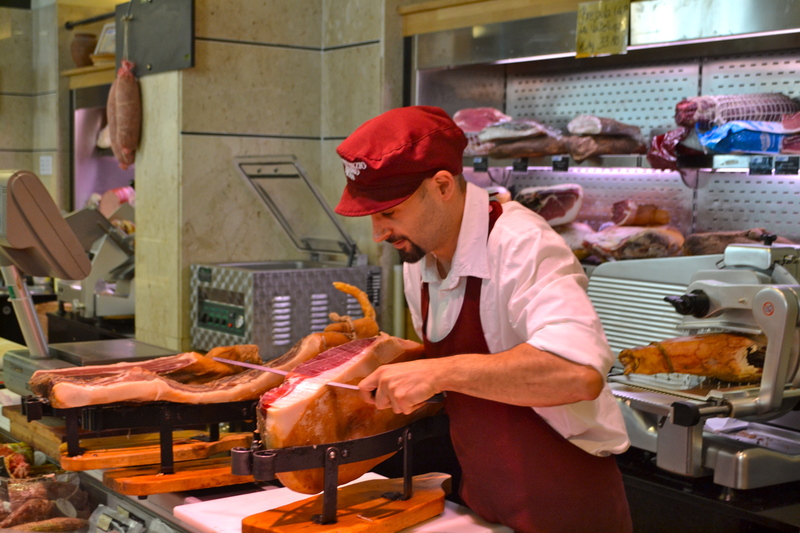 Or enjoy a delicious range of freshly cut hams. 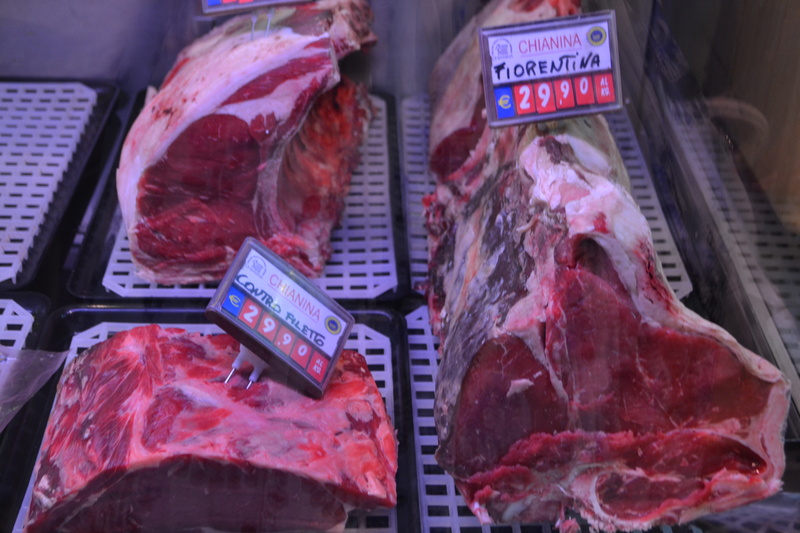 Or treat yourself to some of the local Tuscan delicacies – cinta senese (the regions indigenous Tuscan pig) and Chianina fiorentina. 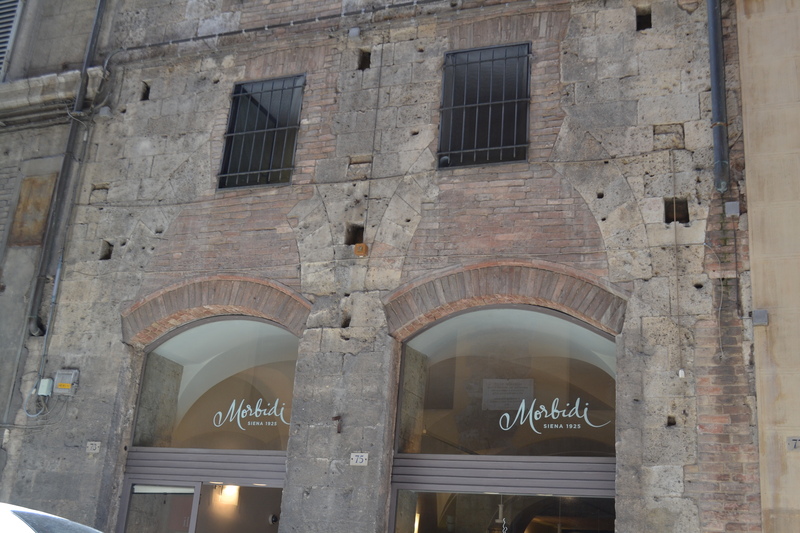 Morbidi is another local institution, initially opening in Siena in 1925. 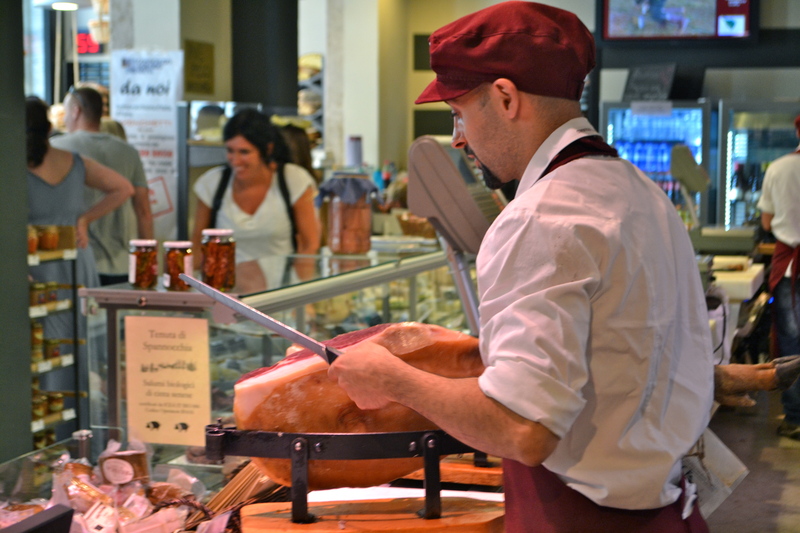 Here you can enjoy a great range of cured meats, cheeses and local wine. 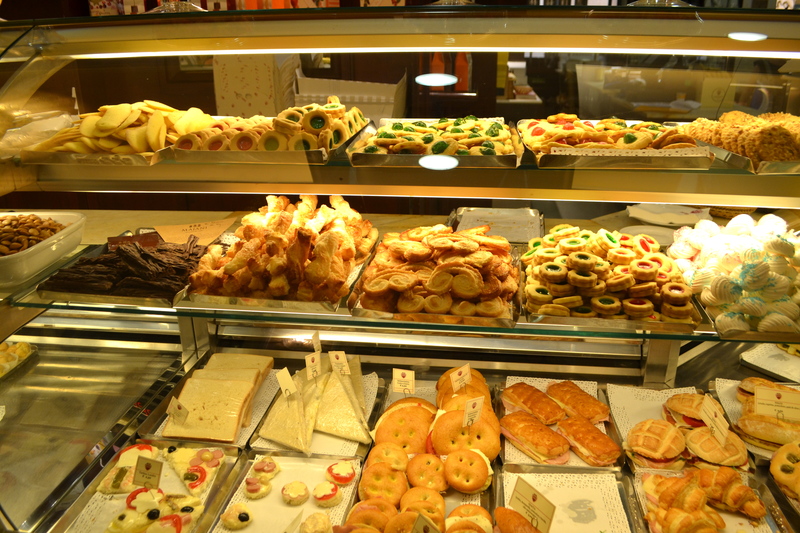 There is also a buffet restaurant downstairs offering diners a mouth watering selection of antipasto, pasta and salads. 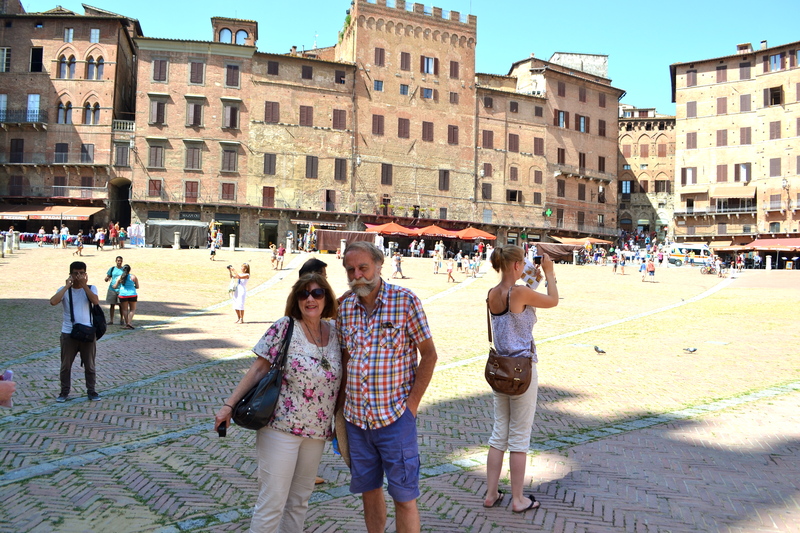 If you planning a visit to Siena in the height of summer, make sure you do what I did and try to get there early before it gets too hot and busy to fully explore and appreciate this magical place. 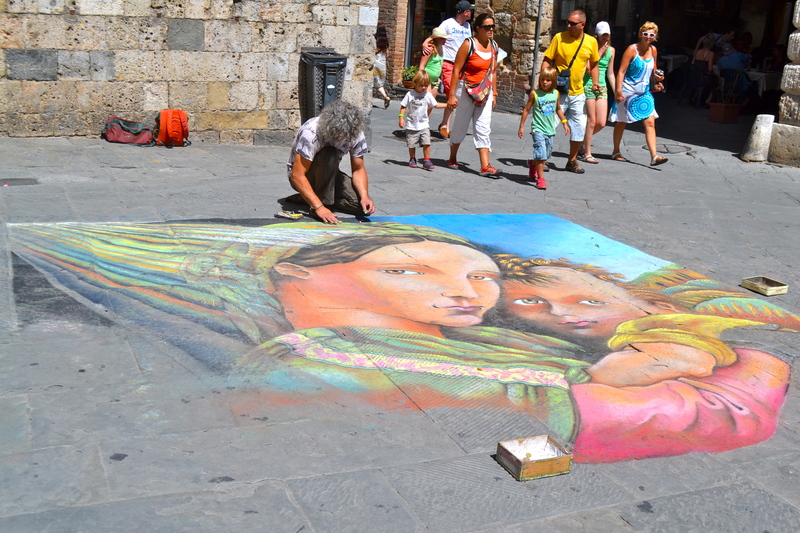 We are heading off to Sienna soon so thanks for the tips. Love the blog. 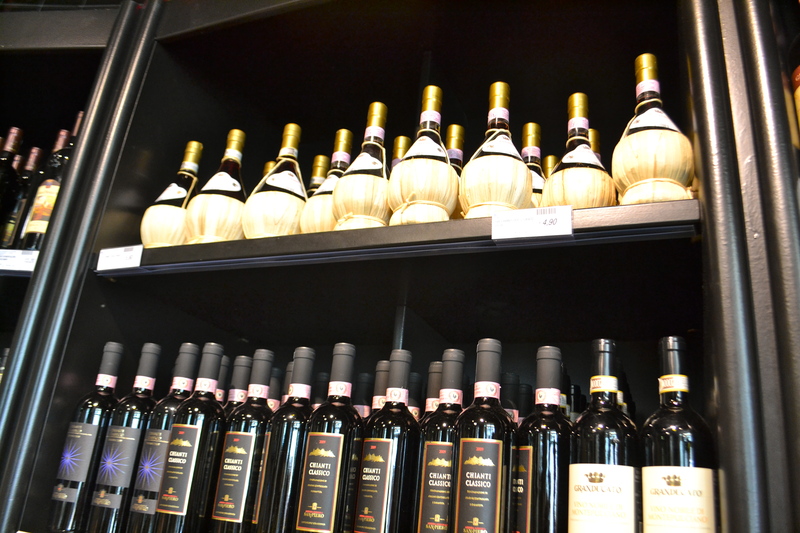 Great to have this visual taste of Tuscany. It’s a region that keeps calling me back. Though we haven’t got the same heritage from the Renaissance, there’s a Catalan region north of Barcelona, the Empordà, known as Spain’s Tuscany, with lots of medieval towns and villages, vineyards and riverbank restaurants and rural life, as well as the city of Girona and Dalí country (Figueres and Cadaquès on the coast). I’ll be writing more about it in my blog soon.